If you want to speed up the development of your .NET applications, you're ready for C# design patterns -- elegant, accepted and proven ways to tackle common programming problems. 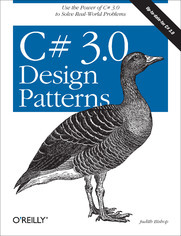 This practical guide offers you a clear introduction to the classic object-oriented design patterns, and explains how to use the latest features of C# 3.0 to code them. Quizzes and exercises to test your understanding of the material. With C# 3.0 Design Patterns, you learn to make code correct, extensible and efficient to save time up front and eliminate problems later. If your business relies on efficient application development and quality code, you need C# Design Patterns.